So my fiancee and I were planning a little trip to London in the midst my final university exam period. 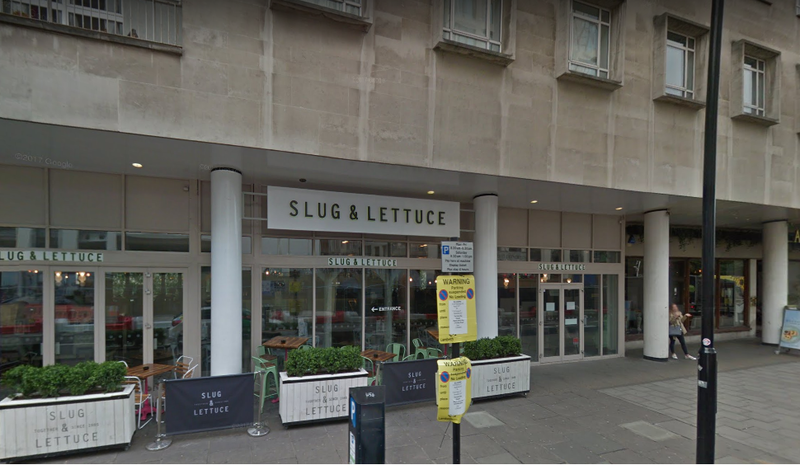 We all know how expensive London can be so we planned that we'd head to a chain restaurant that we looked up beforehand, The Slug & Lettuce. We'd researched the menu for the bar beforehand hand liked the food we saw, plus the prices were not too bad either. We underestimated how busy it'd be so we didn't reserve a table beforehand. Our bad, it is London after all. Upon arrival, we were greeted quite abruptly with "Have you booked?". Of course, though, we hadn't. But a table was still available anyway so we were seated. The waitress informed us that she would be back in a few minutes to take our order. Upon looking at the menu my fiancee decided to have the Smothered Chicken (£10.29) and I wanted to have something different to what I usually eat when out and went for the Chicken Tikka Masala. We also decided to treat ourselves to a Zombie cocktail each (£9.95 2-4-1). It took a while to place this order since the waitress seemed more concerned with 'chilling' at another table of presumably her friends. Once the drinks arrived and we tried them we couldn't complain too much, but that's where the lack of complaining ended. Let's talk about my fiancee's food first with a game I like to call "Spot the Piece of Chicken". For reader convenience, I have pointed out the poultry. 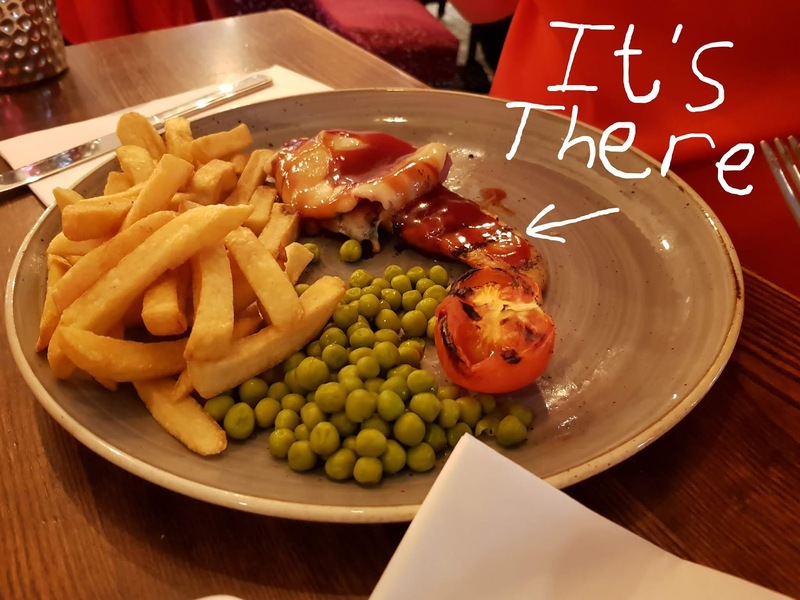 It was dry, bland and even a 3-year-old child would call it bite-sized. I mean, for over £10 you'd expect your chicken to be a bit thicker than the knife you're cutting it with. When I say cutting I mean probing. I guess a good thing to say about this meal is that you can admire the majority of the plate that you're eating it off? Slug and Lettuce? More like Slug and LetUs disappoint you. Once I got the plate to stop sliding around on the...other plate... I got to taste it. 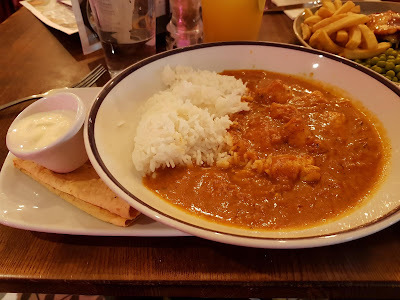 Not going to lie, it wasn't the best curry I had ever eaten in my life. The rice tasted like it had been cooking for as long as it had been grown for. The chicken, like my fiancee's smothered chicken, was on the dry side as well as bland. The sauce looked like it was mostly water and could have done with being simmered longer. We were terribly disappointed with this meal. Terrible tasting food, you don't get much for your money, and chicken you could replace your window panes with. All in all, I give this place a 2/10. That's 1 mark for the table not wobbling and 1 for the fact that the drinks "weren't too bad". Why Do Video Games Keep Growing?